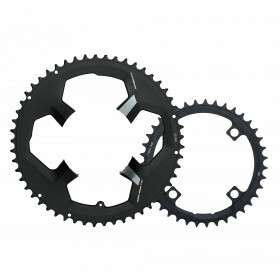 The K-Force WE chain is FSA’s premium offering for 11 speed systems. Whether you’re on the road or hitting the trail, you’ll certainly appreciate all the technology this chain offers. Hollow pins reduce weight, optimized outer plate shapes reduces shift noise, and plate chamfers decrease sprocket wear while increasing shifting precision. If you’re looking for a chain with unrivaled durability and performance, choose the K-Force WE.